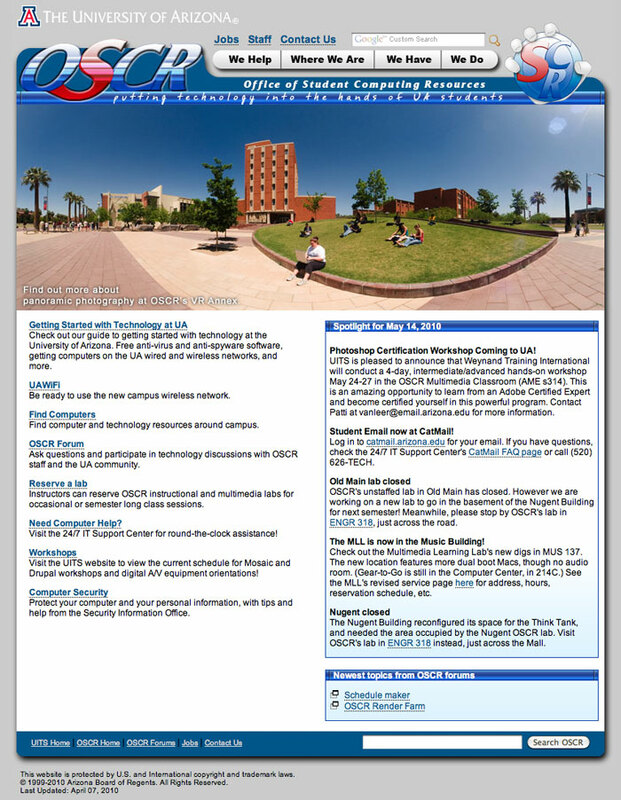 OSCR's mission statement was "Putting technology in the hands of UA students." They did this in a variety of ways. They ran several computing labs around campus, from general access labs, to multimedia labs with specialized hardware and software. They also ran the Gear to Go program, which let students check out multimedia equipment including digital video cameras, still cameras, and audio equipment. OSCR also employed nearly a hundred student employees to run the various labs and services. I was responsible for the overall look and feel of the OSCR website. I created all the graphical elements with the exception of the OSCR wordmark, hand logo, and some of the great photography. Homepage banner images rotated on each page refresh. The images highlighted various aspects of OSCR's services. Spotlight items are entered on the Administration website so they can be refreshed easily by anyone on the staff. Recent posts to the OSCR discussion forums are brought into the homepage through an RSS feed. Organizing the many aspects of OSCR's services and presenting them to our audience on a website was a big challenge. Equipment and software changed rapidly, as did student employees and their schedules. We created a custom web application and content management environment years before software like Drupal was mature. We had to do this in order to allow many different people throughout OSCR to keep their information up to date. We brought all that information together in many places on the websites, such as the following location page. Scheduled open and closed hours, along with reservations for classes and workshops are pulled in from the administration site. Software is tied to locations and employees. This allows you to find what software is in what location, and also which employees are capable of helping you. Scheduling information is also pulled in from a 3rd party scheduling service, allowing you to easily find who, when, and where to get help with your project. Peripherals are a certain type of resource defined in the administration site. Resources are tied to locations so that it is easy to find what locations support what type of peripherals. Student staff are brought in to location pages based on data from our 3rd party scheduling service. They provide us with an XML data feed which we refresh nightly, so we always have an up to date list of who's working where, and when.